Electronic Memory is a duo composed of Mike Hunter on looped guitar/synth and Ken Palmer on synthesizer. 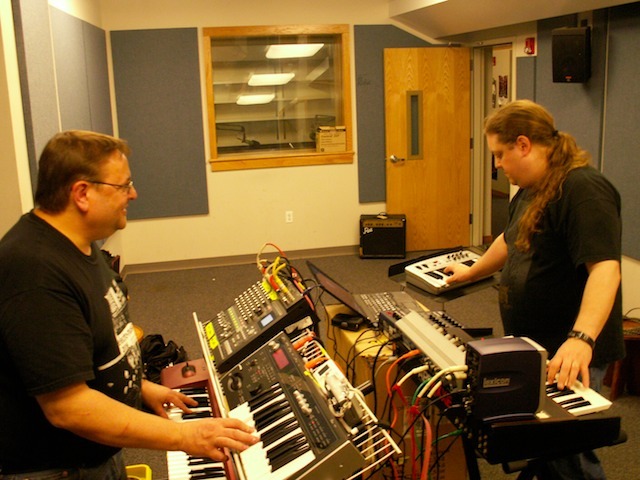 Mike and Ken have performed at the Electro-Music Festival, the New Jersey Festival of Electronic Arts and the Event Horizon concert series, among others. They’ll bring us their mind-expanding style of ambient space music. Ken Palmer and Mike Hunter in the WPRB studios. Mike Hunter hosts a weekly program of ambient and space music on WPRB in Princeton NJ. Find out more about it here. His workaday title is “Principal Technical Architect – Cloud Realization”, which has to be the coolest job name ever. He also performs solo under the moniker “Ombient”. Ken Palmer is a graphic artist and Photoshop wiz during the daylight hours, but after dark he morphs into a synth genius. One of his mods has been featured in Keyboard magazine and he performs as a soloist “Pyxl8r”. He also runs a concert series in the Trenton area called Cosmic Coffeehouse. Some of his pieces are available for audition here. Opening the show will be percussionist Michael Sperone. Michael is a published composer and a graduate from William Paterson University. 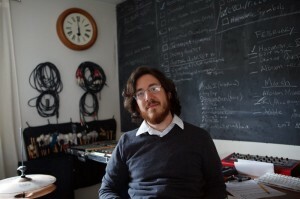 He has some fascinating work that is processed through Max/MSP software to give cymbals a sound from another world. You can listen to more of his work here.